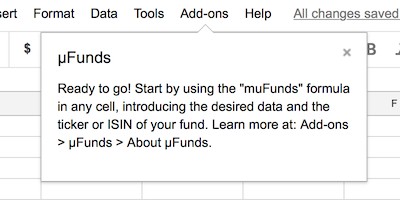 Visit the µFunds page in the Google Sheets add-on store and press the Add (+ Free) button. A new spreadsheet will open. Give µFunds permissions to work in the spreadsheets where µFunds is called. That's it! You can now try and use µFunds in this spreadsheet and new ones if you activate the add-on. 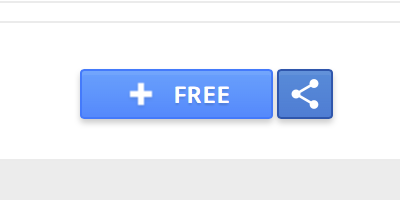 In a new or existing spreadsheet, navigate through the menu bar and choose Add-ons > Manage-addons. A new window will open. For µFunds, click on Manage and press Use in this document. Now you can use µFunds! Just installed? Ready to go! After installation, you are ready to use µFunds via the muFunds function, taking the arguments option, id and source. To learn more about the function arguments and syntax, move to the Usage and examples documentation page. © 2017-2018 µFunds, a Google Sheets add-on developed by José Ballester and the µFunds community at GitHub.